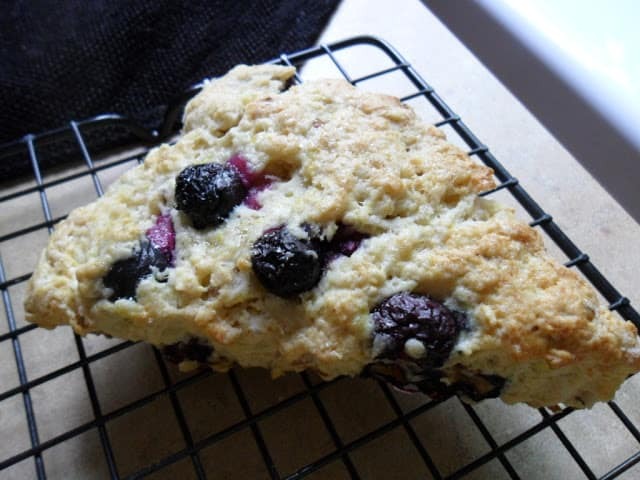 Fresh Blueberry Lemon Scones are wonderful! Scones are great for breakfast or with a cup of hot tea or coffee in the afternoon. This is a great recipe using fresh blueberries and a touch of lemon. Serve these delicious scones with lemon curd or your favorite jam. You can make your own lemon curd, which I often do but I always have a jar of ready made lemon curd in my refrigerator, just in case the ‘scone’ urge hits me. Scone [SKOHN; Br. SKON] This Scottish quick bread is said to have taken its name from the Stone of Destiny (or Scone), the place where Scottish kings were once crowned. The original triangular-shaped scone was made with oats and griddle-baked. Today’s versions are more often flour-based and baked in the oven. They come in various shapes and sizes. Scones can be sweet or savory. When savory, serve scones with soup or stew. Hungry for more Blueberries? Try this recipe for Blueberry Crostata or maybe Blueberry Lemon Streusel Bread. Do you like Dried Blueberries? Yep, so do we. Give this recipe a try for White Chocolate Blueberry Fudge. One of the best ways to enjoy dried blueberries. Dried blueberries can be purchased in most grocery stores, in the same section where you would find dried cranberries and other dried fruit. 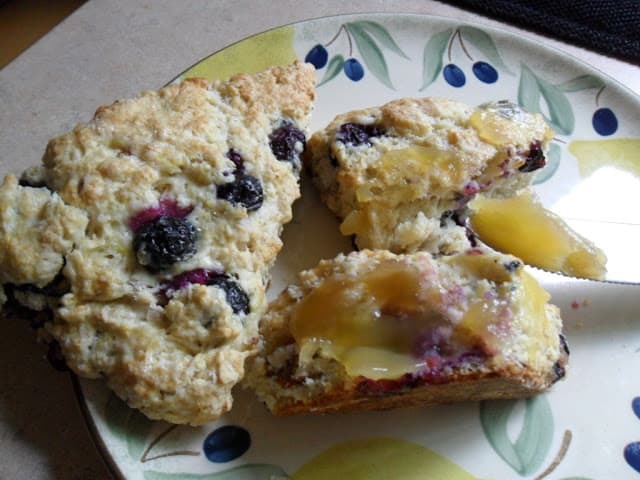 Fresh Blueberries go together beautifully with lemon in these delicious scones. Cut in cold butter with a pastry blender. Mixture should look like coarse crumbs. In a small bowl combine egg, buttermilk, lemon juice and lemon zest. Add to flour mixture. Stir just until dough comes together. Do Not Over Mix. Knead dough in bowl 4 to 6 times. Fold in blueberries and chopped pecans if using. Transfer to lightly floured surface. Pat dough into a 7 inch circle. Cut into 8 wedges. Place wedges on prepared baking sheet. Brush tops of scones with beaten egg, sprinkle with sugar.